For one hour, every year, people around the world are encouraged to turn off their lights in honour of Earth Hour. Earth Hour is a charitable organization, whose mission is to bring awareness to the impact we have on the environment. Since beginning in 2007, Earth Hour has become the world’s largest grassroots movement for the environment, but it made me think: how many of us could live off the grid? As humans, we have a huge effect on the environment. From pulling oil from the ground to the gas emissions we release into the atmosphere, we are unconsciously changing the way the planet functions. Lately, society has become concerned with global warming and many large companies are turning to solar energy to power their buildings. By doing so, they’re reducing the effect they have on Earth. 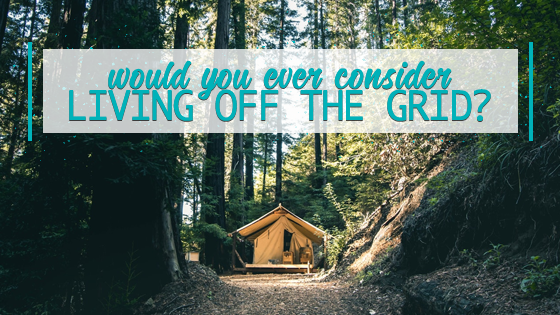 However, there are people who have gone the extra mile and are living completely off the grid. Living off the grid doesn’t exactly mean spending a weekend camping in Jasper National Park, with no cell phone service or Internet (though, that is a good start!). Nor is it completely cutting yourself off from public utilities. It simply means you are living in a more self-sufficient manner. Simple ways you can live “off the grid” without dramatically changing your lifestyle. There are numerous ways you can live more self-sufficiently. While some changes can cost you quite a bit of money, there are other options that you can start with. And no, not all of them involve cutting yourself off from society! Installing a solar power system can certainly help you achieve that self-sufficient status, but it comes with a cost. The average cost of installing solar power on a mid-sized home is roughly $30,000 to $40,000, according to Canadian Home Workshop. The solar energy that isn’t used ends up being stored in the electrical grid (or a battery that’s been installed), and when the days are cloudy, the stored energy will power your home. You can make up for the cost of the installation by producing more energy than you use. With solar power, you have to closely monitor how much energy you’re using. You don’t want to wake up one day and realize that there’s not enough power to make your coffee! If you don’t want to remain connected to a central water system, you’ll want to install a well. The well is meant to pull water out of the ground, via a pipe and pump. Since the well doesn’t rely on any outside source, aside from those installing it, it is extremely popular with those living off the grid. Like solar power systems, wells can be rather expensive, with prices ranging from $1,500 to $12,000. If you’ve decided to distance yourself from public utilities, you may want to consider powering the pump by wind or solar energy. It really is as simple as it seems: unplug electronics you aren’t using, turn off the lights when no one is in the room, and try using LED lights. Minor changes like this can reduce your electricity use by 75%. If you want to reduce the amount of heat you need to keep you and your family warm, consider installing a wood stove. Even drawing your curtains over windows will better insulate a room. With how convenient grocery stores are, many people have stopped growing their own food. However, maintaining a garden is a wonderful way to live off the grid. There are plenty of easy vegetables and fruits that can be grown throughout the spring and summer, which don’t need a lot of ground space! While you may have to carve a little more time out of your schedule to ensure that your garden grows properly, there’s almost nothing better than eating fresh produce. Keep in mind, there’s no right way to live off the grid. You just have to be conscious of the impact you have on the environment and consider how much you’re willing to give up to be self-sufficient. Of course, prior to making these changes in your home, ensure that you are following regulations set by the government and county you live in.